As children grow up, the differences between them increase in every way. Even the youngest differ widely in their natural endowments, their upbringing and their experience, and these are influences which produce a great diversity of talents and temperaments among individuals and make each child a unique person. These differences and the diversity to which they give rise are not always obvious; they can only be discovered through patient study of individual children. Yet their discovery is supremely important for the teacher since they show how wide are the limits of normal development and how varied its forms. (...) It is quite normal for children of the same age to develop at different rates and for some children to develop quickly in some respects and more slowly in others. A child may be more gifted in art or music than in other fields, slow in learning to talk and to read but precocious in learning to walk and in making friends. Moreover, it is normal for a child to develop not at a steady rate from year to year, or even from month to month, but at an uneven pace. An education which attempts to provide fully for such a diversity of aptitudes and abilities must develop practices to deal with these diversities." All teachers know the truth of this. Most human beings know the truth of this. So why do we now say that all children have to reach a certain standard by a certain time? They are even expected to move on by a certain number of 'sub-levels' each year, and some have their learning 'accelerated'. It is normal for us all to be different. Schools claim to celebrate difference. My impression is that most of what they do - or is it what government wants them to do? - is aimed at making everyone the same. 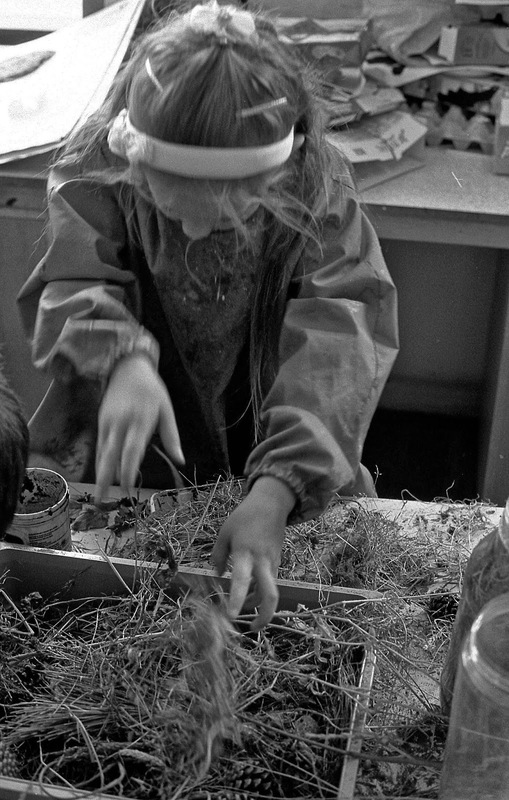 The picture at the top is of a five-year-old attempting to make a bird's nest. I posted about this some time ago, but only just found the photo.